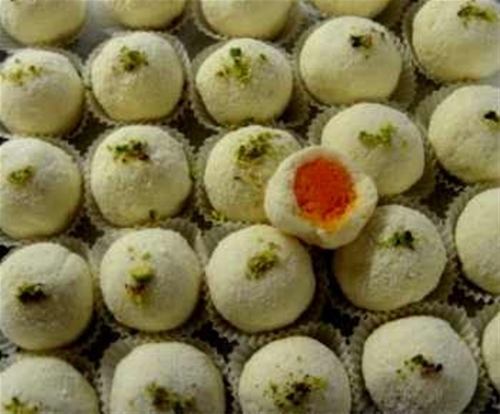 One of Bengal's favorite and classical recipe, Rossogolla is packed with tempting textures, juices and flavors. The sponge is light and delicious with an airy texture that's pure heaven. Bite through to the moist interior and different textures give you even more flavors. Fresh Cheese balls are hand rolled and cooked in very light sugar syrup to make spongy Rossogolla. Then it is thinly covered with plain unsweetened kheer (mawa) to give a delicate final flourish for this homely, comforting, totally tempting and refreshing dessert. Garnished with sliced pista. Store in ref immediately upon receiving, serve chilled for best taste.